NGMA connects professionals in the grants field to improve and unify the grants delivery process by bringing together the professionals involved in this process so that they may learn from each other. 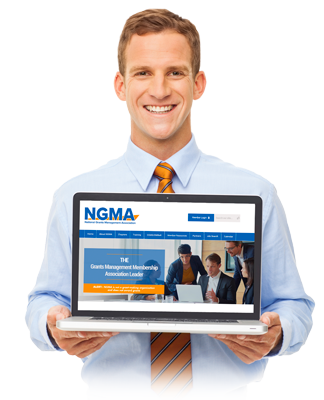 NGMA supports the complete, evolving process of grants management across all levels — from the grantor to the grant recipient — and everyone in between and beyond. Capacity to earn Continuing Professional Education (CPE) credits. Engaging in the advancement, understanding, and recognition of the grants management profession by integrating the NGMA Grants Management Body of Knowledge (GMBoK) into everyday professional practice, ranging from program management to fiscal management to financial management. To find the information necessary to apply for a Federal grant, consult the Catalog of Federal Domestic Assistance (CFDA), www.cfda.gov. The CFDA provides a short summary of each grant program, as well as contact information for Federal agencies that award grants. For more information on grant opportunities, please visit www.grants.gov. Grants.gov allows organizations to electronically find and apply for competitive grant opportunities from all Federal grant-making agencies.